Consider this chart. 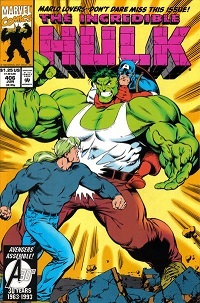 Beginning in the latter half of 1993, Marvel was effectively in constant crossover mode. The Midnight Sons books in particular were going from one crossover to another, but virtually every book was involved in one of many concurrent crossovers (and this is beyond smaller crossovers, guest appearances, and single book "events"). 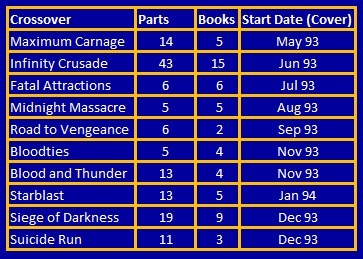 It's worth realizing how many books Marvel was publishing. This year adds a few more titles to what was already a record number. 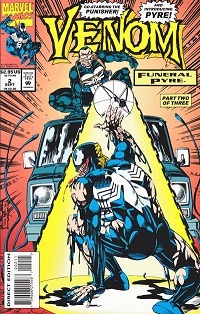 Venom gets effectively his own series (a continuous stream of minis). Secret Defenders and Thunderstrike begin. Marvel begins a line of quarterly Unlimited books, similar to the Giant-Size books of the 70s. Marvel UK continues to push stuff out, hoping something will stick. There are a lot of miniseries (Deadpool, Gambit, Terminatrix Objective, Thor Corps, and more). There are so many books to promote that the Bullpen Bulletins begin coming out on a weekly schedule instead of monthly. Books are increasingly organized under group editors, allowing for the management of the expanding families of books (and setting things up for the editorial silo period). But underneath this glut were signs of major trouble. Lateness was a big factor this year, with many books, even important parts of crossovers, coming out weeks or even months late. 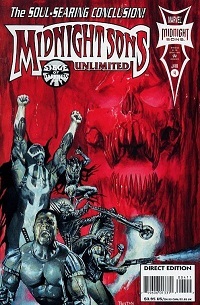 Marvel was losing sales to an increased number of third party comics companies. 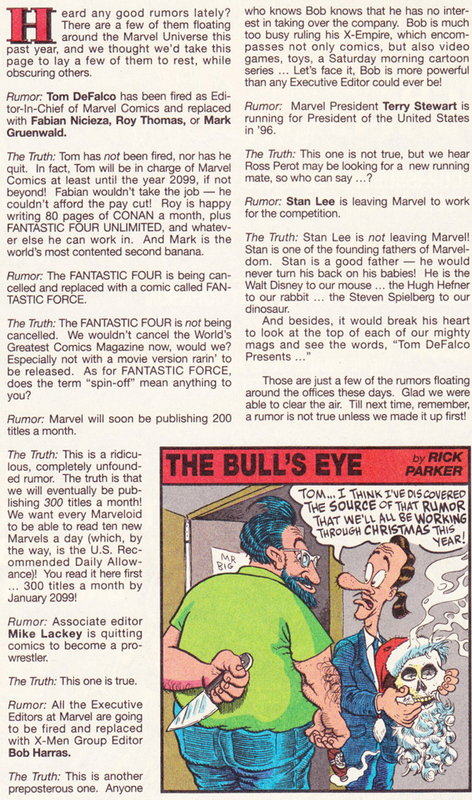 And the speculator market began to peter out, leaving behind only fans fatigued by endless crossovers and gimmick covers. A wave of cancellations begins at the end of this year and will continue into next. A December Bullpen jokily dispelling rumors contains more truth than was probably intended. There are not many significant creative teams changes this year. The biggest changes, both for the worse, are Peter David leaving X-Factor and Alan Davis leaving Excalibur. Regular cover prices remain steady but with the number of gimmick covers and other special price points, it doesn't feel that way. Big inserts were put into a lot of books this year, advertising upcoming events, and making books feel thicker without providing more content. The Fall From Grace storyline in Daredevil results in a new costume for DD and the return of Elektra. Cable is revealed to be the son of Cyclops (and not the clone). Magneto returns, pulls out Wolverine's adamantium, and is put in a coma by Professor X.
Mr. Fantastic and Dr. Doom are seemingly killed.